According to our How’s Business? 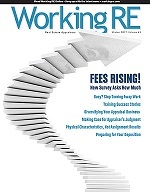 survey (click for results), most appraisers are as busy or busier than last year. There’s still a lot of grumbling on the blogs but the silent majority seem to be back to work. Most appraisers we talk to at OREP, to place their insurance, tell us they are scrambling to keep up. One caveat- this is being written in the spring when times are good; you are reading this in summer, which tends to be a slower time. We hear AMC fees are rising in general, especially for those who refuse to work for less. Many of you are diversifying into non-lender work that is more satisfying and provides more security and stability. Many are learning how to fire clients who are more trouble than they are worth or refuse to pay what the job is worth. AMC ranks are thinning too but as appraisers get savvier and more sure footed, those AMCs who want the best appraisers will have to compete for them. When the banks care about using he best appraisers, AMCs will care. Many appraisers are learning their rights and responsibilities in this post real-estate-collapse world of increased state and federal regulation. It is a double-edged sword: appraisers have more protections and rights than they might realize but they also are under closer scrutiny to do creditable work. It’s important that everyone knows what is expected of them as there are severe consequences for lenders, AMCs and appraisers who run afoul of the rules. The profession has suffered an unprecedented assault; most appraisers lost something, some lost everything. But today many are still standing- a few are stronger than ever. The ranks are thinning as we all know but as a result, fees and opportunities are growing. No matter what happens with customary and reasonable fees or other changes which may or may not restore fairness to the profession, it feels like we’ve turned some kind of corner and are moving ahead.